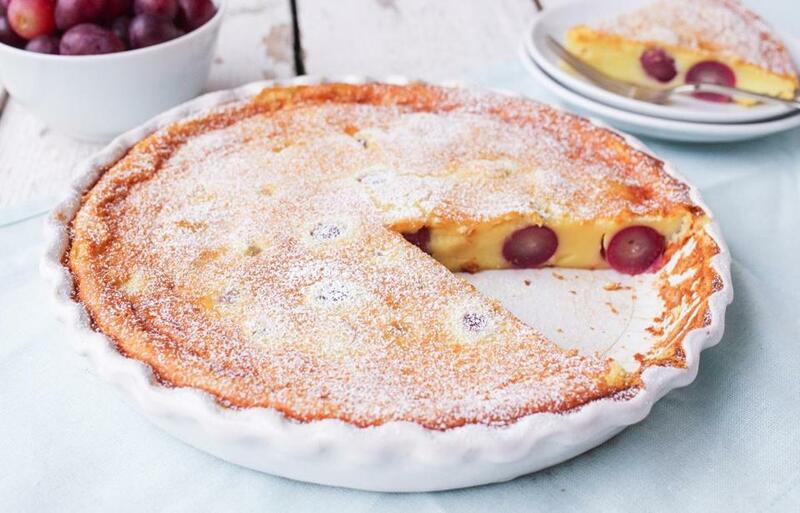 The fruit and custard dessert clafoutis originated in the Limousin region of France, where it was made with unpitted cherries (a little messy for guests; later versions of clafoutis were often made with pitted cherries). In this dessert, seedless red grapes are used. They’re spread in a buttered and sugared baking dish and covered with an easy blender custard. The grapes do not blanket the entire dish, but there are enough so every spoonful has fruit. The custard rises as it bakes and settles as it cools. Before serving, the top is decorated with a light sprinkle of confectioners’ sugar. 1. Set the oven at 375 degrees. Butter a 10-inch round baking dish or pie plate. Sprinkle it with granulated sugar to make a thin, even layer on the bottom. 2. Arrange the grapes in the dish. 3. In a blender, combine the eggs, ⅓ cup granulated sugar, salt, vanilla, cream, and milk. Whirl to blend thoroughly. Add the flour and blend until smooth. Pour the mixture over the grapes. 4. Transfer to the oven and bake for 35 minutes, or until the top is golden brown and feels set when pressed with a finger. Jean Kressy can be reached at jeankressy@comcast.net.